WA Field and Bowhunters Inc. is affiliated to the Australian Bowhunters Association (ABA) and encourages the use of all forms of archery equipment and styles: from traditional barebow to modern compound "unlimited". It also provides the responsible and ethical pursuit of archery in its ultimate historical endeavour: hunting. With its nationally recognised "Bowhunter Proficiency Certificate" the ABA through clubs like WA Field and Bowhunters Inc increases awareness and respect for the environment as well as the importance of preserving the environment for future generations. At the same time it provides a healthy outdoor, equal opportunity, family activity that is fun for all, at all levels. Not all our members hunt and our main game is Field Archery. Historically it originates from the ancient necessity of practising using a bow to provide food for the table. The hunter(s) would pick random objects such as tree stumps or ant hills, etc… at unknown distances to shoot at. This would allow them to improve distance judgement and accuracy. Given suitable, sufficient and safe country to practice it on, this has become known as "roving", or in its military counterpart: “shooting the roving marks". Field Archery is a more formalised version of this simple game where the targets are regulated in size and pattern, varying from paper roundels to urethane foam animal replicas. 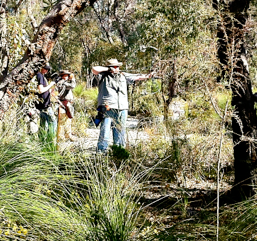 Targets are set out in a natural bush setting. A "round" of Field Archery is played in a similar way to golf. Targets are set at varying distances, being marked or not depending on the round's rules. The archers form small groups (3 or 4 people) and proceed through the course shooting and scoring as they go. Then they move on to the next target and so on. The number of targets vary from 20, to 40 with one to four arrows are shot at each target depending on the round. Depending on the round being shot, with the number of archers and the terrain, a round will be of 2 km to 5 km and lasting one to three hours. For more information on the club, see here. If you can't find the information you are after, then just send us an email.